The Market Pavilion Hotel in Charleston pairs old-world charm, service and ambiance with modern comforts in a luxurious setting. 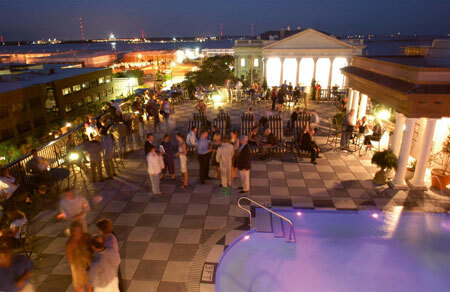 Located in the heart of the America's largest living historic district, this charming boutique hotel is located at the corner of Charleston's most famous intersection, Market and East Bay, just steps from the City Market, waterfront, historic landmarks, shopping and antebellum homes. Opulent guestrooms and suites featuring crown molding, mahogany poster beds, luxurious residential appointments, high-speed internet access, CD players, multi-line voicemail telephones with personal direct-dial telephone numbers, in-room temperature control, lavish European marble baths. Suites are uniquely furnished reflecting the grand colorful style of colonial Charleston. Select suites offer private terraces, grand pianos, drawing rooms and panoramic city and harbor views.